Commander Vision Phone System is a communication tool capable of accommodating 4 ISDN Basic Rate and 8 PSTN Lines, as well as connect VoIP Lines to the system. A hybrid between key-system and PABX, the Commander Vision can be upgraded by having more system expansion cards, and with the help of its flexible construction structure. 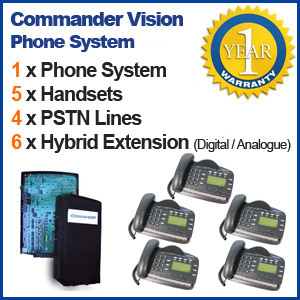 Commander Vision phone system can also accommodate fax machines and cordless phones. Some of the Eftpos features included in the system are Door Phone and Voicemail. Cost-effective, the system can be expanded to 18 extensions and 8 incoming lines. HURRY! It’s for Limited Time Only! All features with (*) are considered optional and can be included in the package if requested. Australian businesses have been patronizing Commander for over 30 years now. The company offers phone systems and solutions for businesses that need them. Commander supports businesses by improving the communication function of the customers. With advanced and efficient communications solutions and technology to offer, the company remains as a big help where companies can rely on. With years of experience, Commander is composed of experts and specialists in the field. These experts are able to innovate and develop solutions that will not only help customers improve their communication needs but also cater to their needs in a way that not complex and easy to understand and use. Besides the products and solutions it offers, Commander is proud of its Customer Care. Customers can expect efficient and fast response when in need for technical support, especially for the setup, installation and maintenance of the Commander product purchased by the customer. Telephonesonline Pty Ltd provides its customers with topnotch customer service, rivaling the topnotch phone systems, which the company also offers. The company offers new VOIP phones or refurbished ones depending on the customer’s needs and condition. It also offers product purchase by singles or by wholesale. This is how extensive the offers of the company are. Telephonesonline is also extensive when it comes to service. Unlike other companies which would avoid complaints and respond to queries very late, the company accepts customer queries and complaints and respond to them promptly in order to not waste any time, both the customer’s and the company’s. Telephonesonline offers products that the company could stand its ground on. From the deals and products to the packages, the company makes sure that what it offers is what the customer needs. This is how it could proudly stand side-by-side with every offer it provides. And being online makes it even a lot easier for customers to check it out. Its Sydney Office is located at 73 Victoria St. Smithfield NSW 2164.